Hello, and happy Monday! It feels SO good to sit down and write a blog post after a crazy couple weeks. I’ll get more into that in a post later this week, but I just want to say a quick thanks to all of you who sent messages for our wedding anniversary and in regard to the passing of Ryan’s grandma. It meant so much to us and made a difficult few days a little easier. But, enough of that for now! Onto today’s post that actually was inspired by our unexpected extended vacation. The services for Ryan’s grandma were held about an hour away from where my parents live outside Chicago. So, it made sense for us to just stay there a few extra days instead of trekking back and forth from Wisconsin. Luckily, I had all the toiletries and makeup that I needed, but what if I didn’t? My luggage could’ve gotten lost, or I decided not to pack makeup for vacation. Pretty sure the apocalypse would happen before I’d make a decision like that, but you never know. I got to thinking about what I would do if I had to buy a new makeup collection from Target. For obvious reasons, I chose Target because you can find one practically anywhere and it’s affordable. I already use a fair amount of drugstore and budget-friendly products that can be found at Target, so this was both fun and relatively easy to put together! Affiliate links are used throughout this post. Thanks for helping me make a few cents at no extra cost to you! I’d obviously first have to pick up some new brushes and tools. The L’Oreal makeup sponge is a must, and then I’d add a mix of brushes from e.l.f. and Real Techniques to my cart. The Sonia Kashuk eyelash curler also would find it’s way in there. Then, I’d add the L’Oreal Pro Matte Foundation and Maybelline Instant Age Rewind Concealer to my cart. Since I can’t live without a little color on my face, the Neutrogena Natural Radiance Bronzer would do the trick. I’d turn to the classic CoverGirl Blush in Soft Mink for a soft pop of color on the apples of the cheeks. Brows are a no-brainer – the NYX Micro Brow Pencil is what I use daily anyway. I’d skip shadow altogether to keep things simple. For lashes, all I need are the dream-team duo of L’Oreal Voluminous Lash Primer and L’Oreal Lash Paradise. And finally, to set everything I’d pick up the L’Oreal setting spray. 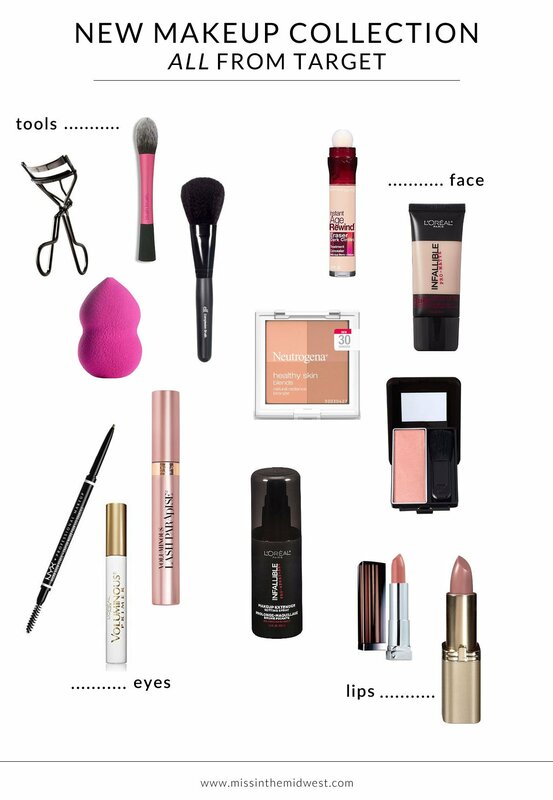 Well, there you have it – what I’d pick up if I had to buy a new makeup collection from Target. 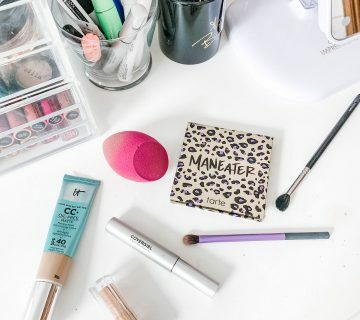 I tried to keep things simple since if this scenario were to happen, I’d solely focus on getting products that would help me look classic and polished – no crazy trends or Instagram-worthy looks. 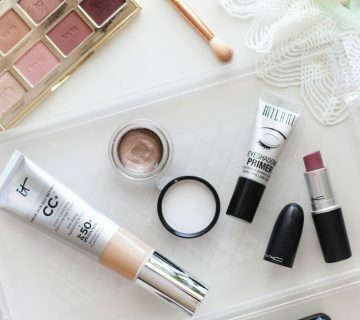 All of these are great options if you’re in a bind and need makeup quickly, or if you’re just starting out in makeup and looking for a few solid drugstore finds! 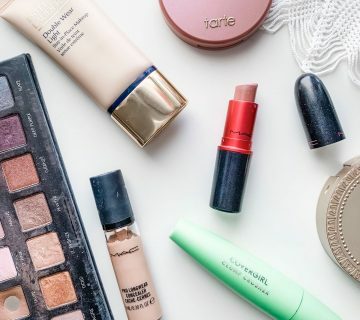 Could you buy a whole new makeup collection from Target? What are your must-have drugstore products? Also check out new and rediscovered beauty favorites for fall! Well I’m going to Target today so I may have to pick up a few of these! That Covergirl blush looks gorgeous and I keep hearing great things about the L’Oreal mascara! Awesome picks! Thanks for sharing! This is such a handy list- also good for traveling if you’ve forgotten one or two things from your makeup routine! This is such a great idea for a post! And I think 90% of what I use everyday could be found at Target lol! I use a lot of the products you mentioned! I need to try that matte foundation! Thanks, girl! I would love to see what you’d come up with for a post like this since we like so many similar things. That matte foundation is the best! Again wishing I had a Target close by! I need a setting spray so badly, and I also always have to have a pop of color on my cheeks – make me feel like I look awake:). I need to try that lash paradise! I am a fan of anything eye by L’Oreal. I’m sorry to hear about his grandmother. It’s such a great mascara! A lot better than the original Voluminous (in my opinion). And, thank you, much appreciated. That L’Oreal setting spray is like the best 10 bucks I’ve ever spent!! I love it 🙂 I also love these posts too!! I would love for you to stop by and say hi! It’s such a good drugstore option for a setting spray! I always worry about what would happen if my bags were to get lost on the airplane, but I never thought about what I could get as far as makeup at Target. You’re totally right though that a Target is basically everywhere, and I’m thinking that I need a backup list, just in case! Absolutely! Like Ashley mentioned in her comment above, this list also could work if you get somewhere and simply realized that you forgot to pack a few things. Can’t go wrong with Target! Thanks so much. I’ve had no issues with the staying power of the brow pencil – obviously if it’s a super hot day it might wear off a little, but I’ve worn it for a few years now with no complaints. I also set it with a brow gel so that might help. Love Target! Never knew they had such a great selection of make-up there! It wasn’t the best of circumstances, but it was really nice having all of you here for a few extra days. Most of my makeup (what little I wear, haha!) comes from Target, I think the selection and quality can’t be beat! We enjoyed our extra time with you, too despite the circumstances! ‘Gotta love the Target beauty section – there really are some gems there! I just used that L’oreal mascara for the first time this morning and I really liked it! That’s great! I think it’s one of the best drugstore mascaras out there. Yes! Such a good eye/lashes combo. And, thanks lady – definitely still getting back into the swing of things, so I sincerely appreciate your thoughts!